Hello everyone! It is already Thursday and in just one week, we will be celebrating Thanksgiving. Thanksgiving is a special time of year. We enjoy our family and friends, we give thanks and we focus on FOOD! Sometimes that focus is too negative and people start to feel guilty about the thought of indulging in their favorite holiday dishes. Today I want to remind you to ENJOY! The world won’t end if you eat too much or drink too much or skip a workout. But I also understand that some of you will still want to find a way to enjoy all the food and stay on track. This post is for people who are trying to stay on track during Thanksgiving and are looking for a little guidance. Because there are really two options: go crazy and eat & drink everything and feel GOOD about it (yes good) OR have a plan in place to eat healthy but indulge with moderation and feel GOOD about it! I never want you to feel guilty about eating! 1. Keep doing Intermittent Fasting - this really helps you control your appetite and prevents over-indulging too much. Prepare for the day by extending your fast by an hour or two on Wednesday. You can also do this as a follow up on Friday. 2. Drink lots of water to stay hydrated. If you’re drinking alcohol, try to follow each drink with a glass of water. 3. Make calculated choices: Eat your salad and other non-starchy vegetables first. Fill your plate with all the turkey! Save the starchy vegetables and fruit for last. 4. Plan to workout at some point: early on Turkey Day is popular -> in my hometown, I used to run the Thanksgiving Day Race in the morning and enjoy all the yummy food that night. Or make sure you get in that Leg Day workout on Saturday and skip the treat if you over over-indulged on Thursday. You could even do a low carb day on Friday and get in a quick HIIT workout! Just get right back to it! 5. Thoroughly enjoy the foods you love and skip the ones you don’t! Spend you macros on your absolute favorites. Don't waste them! If you’re already focused on healthy eating and exercising the right amount, you will not derail yourself on one holiday! 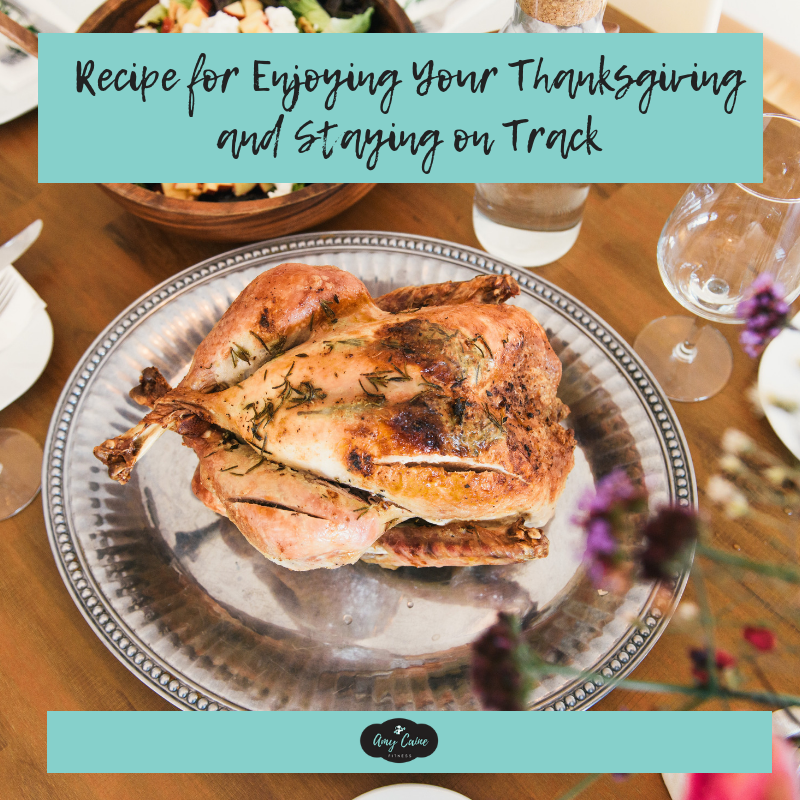 You can absolutely enjoy your favorite Thanksgiving dishes and stay on track! My tips incorporate strategies that we use in the FASTer Way to Fat Loss® program. Learn more here. I hope you find these tips helpful. If you do I’d love for you to leave a comment below letting me know!